TPP is excited to announce their second Physics Challenge on Tuesday 4th February, in collaboration with Bristol Chaos! Unlike a typical pub quiz, you'll need to exercise your problem-solving skills to tackle the range of challenges set instead of applying your general knowledge. Tickets are free and for members only. They are limited to one per person and will be available from Tuesday 29th January for those who did not attend the last TPP pub quiz, and from the 30th January for everyone else. Please note that if you buy a first release ticket and have been to the last TPP quiz, your ticket will be cancelled and you may not be able to buy another. As before, there will be free food and drinks, both soft and alcoholic, available for attendees throughout the whole event. There will also be great prizes on offer for the winning teams. We recommend teams of about 5-6 people, but smaller groups are welcome too, and if you're unsure who to come with then we'll be happy to match you up with other keen problem solvers on the day. Some questions require specific knowledge so you will want a physicist on your team! By attending this event you are happy for Chaos to hand over your Email address to TPP. If you are no longer able to attend the event please email bristolchaos@gmail.com to return your ticket so someone else can attend. If you do not attend the event but have a ticket, you will be blacklisted from the next 2 events. Monday 5th November. Get your early bird tickets from 11am. But be careful, they sell out fast! It's that time of year again. The event you have all been waiting for is just around the corner. Get your elegant attire, and snazzy dance moves ready as you are invited to the biggest and best night on the CHAOS calendar - PHYSBALL 2018! Expect an extravagant evening of fine dining, drinking and dancing to your favourite BUJO tunes! *Wine will be provided, we claim no responsibility for those who drink your share. This is Chaos’ second trip of the year and we are going to visit Airbus to visit some of its facilities, such as the Wing Manufacturing Facility, Landing Gear Test Facility and hopefully the wind tunnel! We will get to see the inner workings of the facilities and hopefully get to see some testing! Tickets cost only £2 and cover the cost of transport to the site over in Filton. 1pm - Meet at meeting point at The Centre (C12) bus stop - at the bottom of the Christmas steps, near courtrooms. As Airbus is a military organisation, they will not allow anyone born in or with nationality from the following places, into their Wing Manufacturing Facility, therefore if you are born in or have nationality from one of these places, we regret to say, you will not be able to come on the trip. Afghanistan, Armenia, Azerbaijan, Belarus, Bosnie-Herzegovina, Burundi, Central African Republic, China (PRC), Cuba, Cyprus, Democratic Republic of the Congo, Egypt, Eritrea, Guinea, Guinea Bissau, Haiti, Iran, Iraq, Kyrgyzstan, Lebanon, Libya, Mali, Moldova, Myanmar (Burma), North Korea (DPRK), Russia, Somalia, South Sudan, Sudan, Syria, Tunisia, Ukraine, Venezuela, Yemen, Zimbabwe. Students must bring their student ID or will have to pay for their bus ticket themselves. No photography is allowed on site therefore phones may be collected before the tour. Sensible flat shoes and appropriate clothing must be worn. Anyone who wants to come on this trip must be over 14 years of age. Airbus reserves the right to cancel the tour due to unforeseen circumstances. In this case, a full refund will be given. All other refunds will be at the discretion of Chaos. Students must agree to the trips terms and conditions. Chaos is heading down to the We the Curious Ice Rink in Harbourside! Come along on Thursday 22nd for some festive fun! Ticket are £5 and are available on the SU Website, or from the Bristol Chaos website. Possible trip to The Apple afterwards (without Ice Skates). WHAT: Chaos is heading to Geneva for three days to visit the LHC and other facilities with spare time to explore the city and see the sights. The details and price of the trip are not finalised and may change. If this means you no longer wish to come, you will be fully refunded. TPP is excited to announce a Physics Challenge on Thursday 15th November, in collaboration with Bristol Chaos! Unlike a typical pub quiz, you'll need to exercise your problem solving skills to tackle the range of challenges set instead of applying your general knowledge. Come along to your scariest physics experience since your last quantum exam! Fancy dress is strongly encouraged. Please add to to Spotify playlist below, which will be the music for the evening! The event will be raising money for charity, with £1 per ticket going to the mental health charity Mind. This is the Spotify playlist that'll be used for the evening, add your favourite songs you'll want to hear as you dance though-out the night! Tickets cost £3.50 for member and £4.50 for non-members, and will be available from 11:00am Friday 12th. Its all happening Friday 26th October 10:00pm till late, at basement 45. Kick of the year with a BANG! It's time for the legendary physics bar crawl! The one event that reminds returners that they are still capable of having fun despite their old age, and introduces young and naïve freshers into the city and the wonders of physics. Join Chaos at the start of the new year with a selection of home made cakes and coffee! Perfect for freshers to come and meet their course mates and for returning students to kick off the new year! Physics is very lucky to have it's own coffee shop run by students for students. Proudly boasting that it sells the Bristol's cheapest coffee, Physbar is open week day lunch times from 1pm to 1:50 pm. click the link above to find out about the menu. No lunch time is complete without a trip to Physbar! Sign up to The Parenting Scheme here! Kick off the new year with one of Bristol Physic's best traditions, The Chaos Parenting scheme! Sign up on the links above and Chaos will provide you with a "Physics Family". Families usually consist of 2-3 older students/parents and 3-4 freshers/ children and are an informal mentoring service where you can meet your course mates and hear what it's really like studying at Bristol! They can advise you on who the best lecturers are, where the best pubs are and so much more. - First year can be a bit of a jump from A-levels, and your "parents" have been there and done that. - Struggling with a problem sheet? No idea how much to write in your lab book? Chaos parents are second and third years, so they can give support and advice about the course. - Moving to a new city, with new people and places can also be daunting. Chaos parents can be really useful to ease the transition into student life. - Chaos host popular "family" events which quickly break the ice. Also, after a couple of years in Bristol, your parents should know all the best pubs/clubs/restaurants by now! So feel free to ask about anything not academic too. - Chaos is committed to creating a welcoming and supportive environment from the very start. Sometimes other students are just easier to talk to than staff. 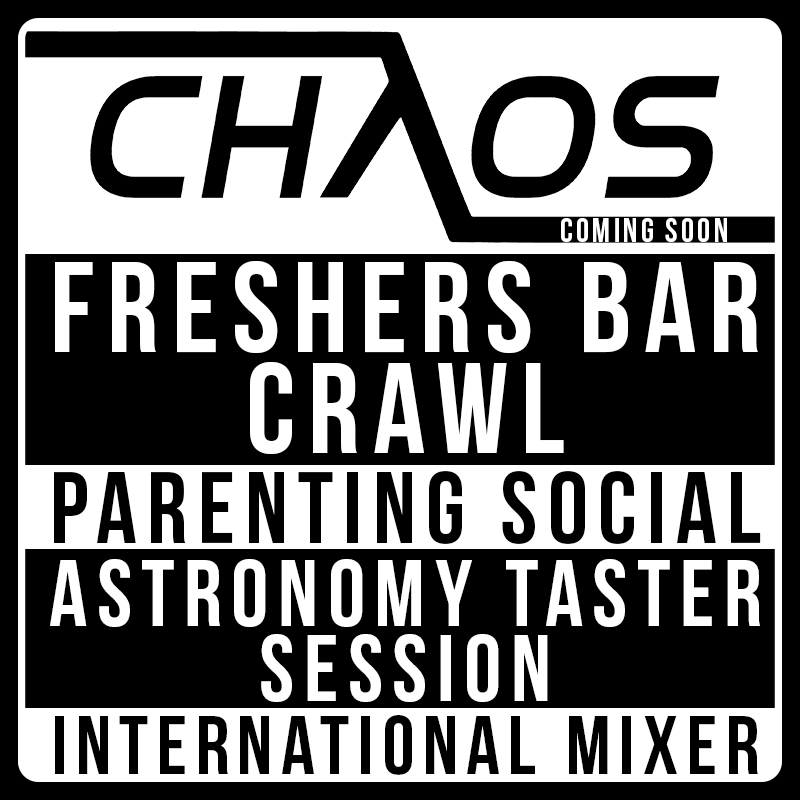 We are finally living up to what we tell the freshers: CHAOS IS GOING TO CERN! WHO: All those who had lost hope we'd ever actually do it. Hold onto all of your excitement for particle physics and save the dates, you'll hear from us again soon with details! Head over to the Facebook event for more information! Interested in YouTube or Climate Science? Simon Clark is a PhD student at the University of Exeter conducting research into climate science and also runs a popular YouTube channel producing interesting scientific videos. In this talk Simon Clark will cover his progression as a YouTuber and how his studies and research have helped him produce entertaining and informative content on science in pop culture, vlogging the life of a PhD Student, and even the recent cold weather we have been having. Check out Simon Clark's YouTube Channel and the Facebook event below. Take a Schrö-ad off and come to Airhop with Chaos! In continuation of Industry Month, Chaos is bringing you a range of talks from different industries in hopes of broadening your career prospects. This is an exciting opportunity to network and explore your options beyond what you may have already considered as a job after uni. "Fuel Loads in Large Civil Airplanes"
The research on fuel loads at the Airbus Loads department will be put in context with the broader view and needs of the aerospace sloshing community. The application of a novel methodology for free surface modeling, developed in partnership with the University of Cape Town will be presented. An overview of the “Validation and Verification” process undergone by the method will be shown, with comparison of numerical simulation and experimental results. Further analysis of dynamic loads on the walls of fuel containers will be discussed for certain cases of interest for large aircraft. The industrial applications of a Reduced Order Model (ROM) developed to cover the design space of the fuel tanks will also be presented. Over the coming weeks Chaos is bringing you a range of talks from different industries in hopes of broadening your career prospects. This is an exciting opportunity to network and explore your options beyond what you may have already considered as a job after uni. TTP is a specialist technology development company that works across a wide range of physics and engineering to provide customers with technology and product solutions to their real world problems and opportunities. The talk will give some idea of our breadth, which runs from satellite communications to medical devices, but will focus particularly on a project we are currently working on to reduce methane leaks from the gas grid for Cadent Gas (formally part of National Grid). Fugitive gas emissions are a problem across Western Europe and the Eastern United States where pipes, originally installed over 100 years ago, leak at the joints between pipe sections. Because of methane’s strong greenhouse gas effect leakage reductions here will have a meaningful impact on the UK’s greenhouse gas emissions. "Laser technology for the Orion Facility at AWE"
The Orion Laser Facility at AWE Aldermaston represents our capability to undertake High Energy Density Physics experiments in support of the UK’s nuclear deterrent. It undertakes a large range of experiments including high temperature opacity, material strength under high pressures, equation of state of warm dense matter, etc. Up to 15% of operational time supports independently chosen campaigns for the UK academic community. This talk will describe the laser technology that drives these experiments. Ten ‘long pulse beam lines’ each deliver up to 500J in around 1ns at 351nm. In addition, two ‘short pulse beam lines’ can each deliver up to 500J in less than 1ps with focal intensity if ~1021Wcm-2. One of the short pulse beams has been converted to the second harmonic at large aperture, which yields world-leading temporal contrast. This combination enables great flexibility in experimental capabilities. Chaos is going to The Diamond Light Source! Think optical physics is boring? Think again! Come with us to explore The UK's National Synchrotron facility and hear from world leading researchers and their work studying a wide range of real world applications of physics. So brighten up the end of your January by coming to The Diamond Light Source in Oxfordshire! On the 7th December Dr Ole Steuernagel will be coming to give a talk titled: 'A Geometric View of Dynamics in Quantum Phase Space'. With a research position at Hertfordshire, Dr Steuernagel has strong interest the foundations of quantum physics. This underpins his research into Wigner’s quantum phase space current, which governs Wigner’s phase space distribution - a method of representing all states of a system together. Dr Ole Steuernagel’s talk will take a look at his research into this property and its applications. No tickets are required to attend this event! This is it! Physball 2017! An evening known for extravagant eating, drinking, and dancing while looking fabulous awaits. Table selection and menu now available. Head over to the Facebook page for more information! WHAT: A social event starting with Ice skating followed by a trip to The Apple Pub for a drink and a laugh. WHO: People who want to re-enact that question about friction on an ice rink that always comes up in mechanics text books. WHERE: We The Curious Ice Rink/The Apple. WHEN: 7:50pm(to get on the ice for 8pm) on Thursday 30rd November. On the 21st November Dr Annela Seddon of Bristol University will be coming to give a talk titled: 'An Engineer, a Physicist and a Chemist walk into a bar...'. 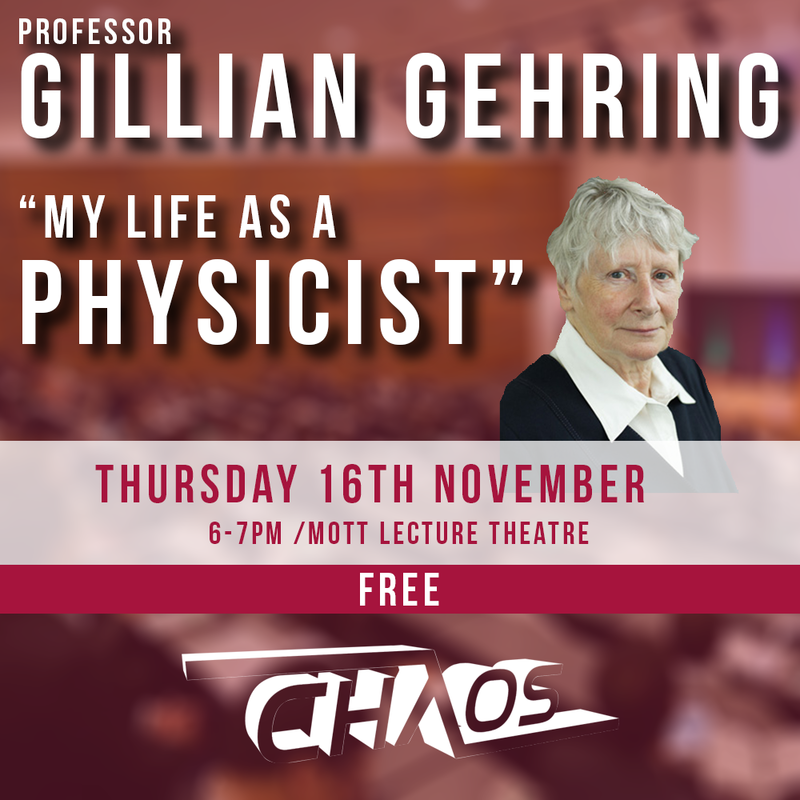 On the 16th November Emeritus Prof. Gillian Gehring of Sheffield University will be coming to give a talk titled: 'My Life as a Physicist'. Gillian Gehring is Emeritus Professor in the Department of Physics and Astronomy at the University of Sheffield. To date the only woman to have held a position of Professor of Physics at Sheffield and the second woman ever in the UK to hold a professorship in Physics. Unusually for physicists, Gillian has contributed greatly to both experimental and theoretical projects and as a result is a distinguished international research leader in magnetism. Her work now focuses on magnetism and orbital ordering, particularly in oxides and has active international collaborations with groups in the USA, Russia, China, Sweden and Saudi Arabia. Gillian has been an unwavering advocate for women in science and has tirelessly campaigned for gender equality in the sciences nationally and internationally. She was awarded the OBE in the 2005 Birthday Honours for services to Physics and to Equal Opportunities. As well as this she was awarded honorary membership of the Institute of Physics and the Mott Medal for her seminal contributions to magnetism. Here it is! Chaos' first social! Come hang out with your course mates and like minded physicists at an exciting evening of bowling and pizza! Tickets cost £5 and are available below! 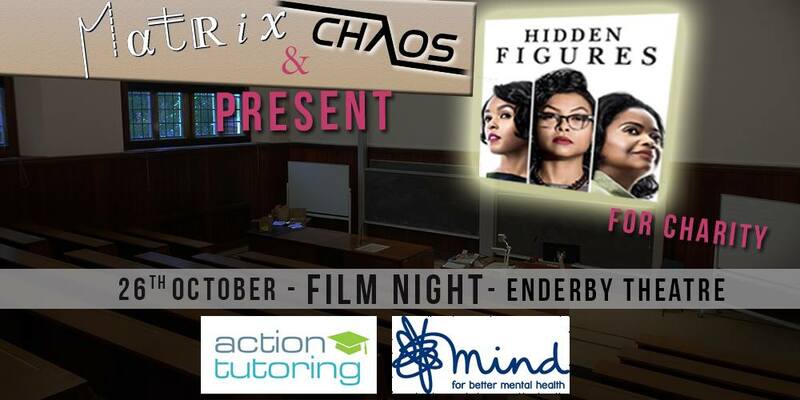 Matrix and Chaos are excited to be hosting a screening of Hidden Figures in honour of Black History Month, on Thursday 26th October in Enderby lecture theatre. Head to the Facebook event to find out more! Ever wanted to see a fusion reactor kiddos? Been sticking those sweet sweet fusion reactor pictures on your wall? Now it's your chance! On Oct 25th we'll be taking a coach to Oxford's Culham Centre for Fusion Energy, where we get to tour around the JET facility and also receive a talk from the scientists who work there. 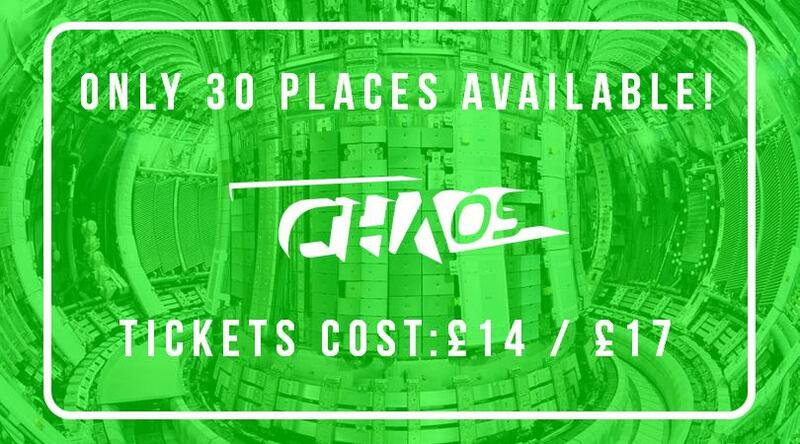 This event is open for members and non-members of Chaos and they'll cost £14 and £17 respectively. There's only 30 places available so get your ticket promptly. Coach journey either way is roughly an hour and a half. 3) Each coach journey is about 1hr 30mins long. Given the unpredictability of the weather recently, it’s tricky to say when would be a good day for observing. 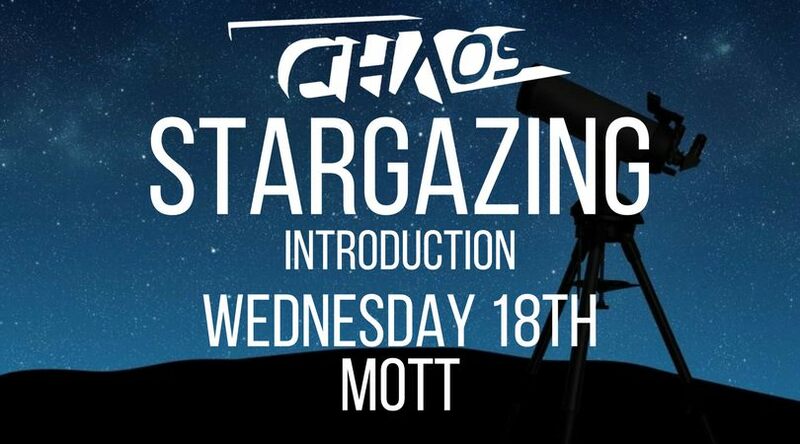 That’s why, on Wednesday the 18th we’ll be meeting in Mott at 6pm to show you all the telescope and answer some questions about astronomy at Bristol, and then hopefully head outside! If it’s cloudy, we’ll still be doing the indoor part and then on later days if it looks like an evening is particularly clear we’ll let you all know on the Facebook page with at least half a day’s notice. Come along to Enderby this Thursday evening for a night of Pizza, Puns and Prizes! This quiz is a great place to meet up with your Physics Family if you haven't had much chance yet, but it's open to everyone, 1st year to 4th, Chaos Member or not, so bring friends new and old! September is almost here and Chaos has been busy all summer preparing a string of socials! Head over to our blog to read about some of what we have in store and make sure to keep checking this space for updates. It’s finally here; the event that kicks off every physicist’s social calendar. The irreplaceable, the unmissable, the legendary… FRESHER’S BAR CRAWL! The one event that reminds returners that they are still capable of having fun despite their old age, and introduces young and naïve freshers into the city and the wonders of physics. Like always, members benefit from cheaper tickets, so what are you waiting for? Get your membership here now! INVITE ALL THE PHYSICS PEOPLE YOU KNOW!!! It's OVER! You've finally finished your physics degree, and now all you want is a Racks BBQ, some sunshine, and lots of alcohol. Guess what, you're in luck! Come to this graduation party, eat lots of delicious food, and feel the weight of three/four years of constant soul-crushing physics slowly lift off your shoulders. You are finally FREE!